As a child of the 80’s, I was excited to see Ready Player One. Ready Player One is a book by Earnest Cline originally published in 2011 (Buy Book). The odd part about this book is I didn’t know it existed until I watched Casey Neistat endorsed it on his vlog (link @4:24). Why is it odd you ask? Because I buy, search, chat, blog, video, etc. about science fiction. I don’t claim to have my finger on the pulse of the genre, but I would hope my volume of exposure gives me a higher probability of interacting with a new book before the populace. In this case, it didn’t. The good news is I learned about the forthcoming movie at the same time. There was no way I could add Ready Player One the book into my already longer than my lifetime queue, so I decided to stick with my rule and wait for the movie. For those of you who don’t read my blog or watch my reviews, my rule is to choose a medium of consumption and stick with it. I find without fail a book is different than a movie, and if I’ve consumed both, I will dislike one. The movie is based in dystopian Columbus Ohio in 2045. People are emersed in a virtual reality called the Oasis. Oasis was created by Halliday played by Mark Rylance. Halliday reminds me of Garth from Waynes World. I don’t love the Halliday character. To build something the scale of Oasis, it takes teams of people. Not just to write the software but to create the stories, the art, the music, and the werables. The movie gives 100% of the credit of the success of Gregarious Games to Halliday. Halliday is portrayed as an introvert who wants to keep Oasis a game. Pitted against Nolan Sorrento, played by Ben Mendelsohn, the CEO of IOI. Sorrento’s evil plan is to over-monetize Oasis. There are scenes where Sorrento is showing how he can place ads on up to 80% of the viewing screen. It’s easy to hate that idea. The part about Halliday I don’t like is he was portrayed as a saint. There is nothing said about how he monetized Oasis so successfully he became the worlds richest person. When characters die in Oasis, they lose all the stuff purchased and have to purchase it all again. It sounds to me like Halliday figured out how to charge people over and over for the same thing. It was also irresponsible to leave the fate of Gregarious Games to a contest. Don’t other people work at Gregarious games? Wade Watts is an 18-year-old who like most people, lives his life in Oasis. His screen name is Parzival. Parzival is focused on solving Halliday’s contest. If he wins the contest, he will be given admin control over Oasis and all Halliday’s money. Wade is played by Tye Sheridan who does a great job. You may remember Sheridan as Cyclops in X-Men: Apocalypse. During the contest, Wade meets Art3mis played by Olivia Cooke. Cooke’s performance was the best in the movie. Since the movie is two-thirds animated the actors had to physically act and voice act. Cooke’s voice acting was phenomenal. The cast, in general, was excellent. I liked how the Oasis was animated. It didn’t try to mimic real life. It was clearly a simulation. I do wonder if the book portrays the Oasis as fake, cartoony and video game-like. I saw this movie in 3D, and it worked very well. The real world interface of the Oasis was where it failed. Oasis is supposed to be an immersive virtual reality experience. You can’t have an immersive experience when people are only wearing the headset. In the movie you see people running around their apartments and jumping on their couches however Wade has an omnidirectional treadmill, and Bungie ropes connected to the ceiling. For a book released in 2011, the technology was terrible. Oasis is no Augmented reality where virtual items appear in the real world. When people are wearing the headset running down the street, it makes absolutely no sense. There are many things about this movie I hated. However, the purpose of a movie is to entertain. I was entertained. I gave my money and when I let the theater I was satisfied with the value I received. As I said at the beginning of this review, I am a child of the 80’s. I loved the references. I can’t wait to own this movie so that I can rewatch it and try to find things I missed the first time around. As a story it’s pedestrian. Play a game and win the prize. Nothing fancy. Without seeing the movie, you won’t need three guesses to figure out how it ends. I wish the game would have been harder and more intellectual. Maybe in the book it was. I can’t help but feel the book was written to cash in on the current age group spending money. Spielberg was the obvious director to double cash in. Well, I’m your huckleberry. 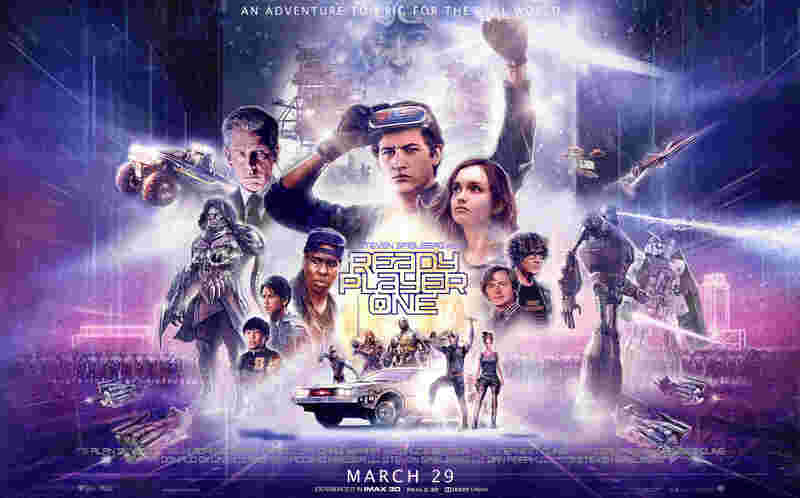 Despite its many many flaws Ready Player One was very fun to watch, and if you are in the 35-45 age group, you will like it also. PS. There is a cool coffee table book about the art in Ready Player One. Check it out here.